The sommelier at olive & june, the popular Southern Italian-style restaurant in Central Austin, has earned the most prestigious wine honor in the Southern United States. Nathan Fausti has been named the 2015 TEXSOM Best Sommelier, beating out a strong field of 22 other competitors from five states. The coveted distinction is one in a list of several wine-related honors recently received by sommeliers in the employ of restaurant icon Chef Shawn Cirkiel. The 2015 TEXSOM Best Sommelier Competition took place in early August, during TEXSOM, the most prominent and influential wine-education conference in the United States. Fausti competed in a meticulous and uncompromising three-part wine exam that included service, blind tasting and wine theory elements, and was judged by an elite panel of Master Sommeliers and Masters of Wine. Previously only open to Texas-based sommeliers, the TEXSOM Best Sommelier Competition upped the ante this year, allowing sommeliers from Texas, Arkansas, Louisiana, Oklahoma and New Mexico to enter, providing a much larger talent pool against which Fausti had to compete. As the winner of the 2015 TEXSOM Best Sommelier Competition, Fausti — who has long worked as the sommelier at olive & june and is transitioning to the sommelier position at Bullfight, Chef Cirkiel’s new tapas-style restaurant — received a $2,500 scholarship from the Guild of Sommeliers Education Foundation, which he can apply to the Court of Master Sommeliers certification program. Fausti is not the only sommelier in Chef Cirkiel’s parkside projects restaurant empire to gain such notoriety. Last year, Joelle Cousins, previously assistant general manager and sommelier at Cirkiel’s acclaimed Sixth Street gastro pub parkside, won the TEXSOM Best Sommelier Competition. Additionally, Paul Ozbirn, the beverage director for all parkside projects restaurants in Austin, was recently designated an Advanced Sommelier after completing and excelling at the Advanced Sommelier exam through the Court of Master Sommeliers, the lauded nonprofit organization that co-presents the TEXSOM Best Sommelier Competition. A rare designation, Ozbirn’s Advanced Sommelier distinction is one only a handful of Austin wine experts hold. These wine-related accolades and distinctions further elevate Chef Cirkiel’s parkside projects restaurants as destinations for not only incomparable award-winning cuisine, but also for unrivaled, first-rate wine and beverage programs helmed by the most knowledgeable and acclaimed sommeliers. parkside projects restaurants include beloved Sixth Street gastro pub parkside, Neapolitan-style pizzeria the backspace, Southern Italian family-style eatery olive & june and the newest member of the parkside projects family, tapas eatery Bullfight. For more information about Sommelier Nathan Fausti winning the 2015 TEXSOM Best Sommelier Competition and the parkside projects beverage programs, call (512) 474-9898, or visit www.parkside-austin.com. This summer and autumn, Walton’s Fancy and Staple, Austin’s most iconic and cherished deli, known for its fresh-baked daily breads, gourmet meats and cheeses, and decadent sweet treats, is serving up the perfect accompaniment to every outdoor family excursion, office party or relaxing afternoon at home: made-to-order picnic packages. Created with deft attention to detail and highlighting the freshest local and seasonal ingredients, Walton’s picnic packages evoke a sense of epicurean elegance, and offer a truly unique, stylishly arranged and personalized picnic experience. With a focus on the best seasonal offerings available from Central Texas farming and ranching communities, Walton’s picnic packages will be available through the fall 2015 season, and include such coveted ingredients as local produce from purveyor Farm to Table and Morsels’ Farm, Walton’s and Bess Bistro’s own one-acre farm, as well as arugula from Animal Farm in Cat Spring, juicy peaches from Pedernales Valley Farms, cucumbers from Buena Tierra Farm, hydroponic bibb lettuce from Bella Verdi Farms, lettuce greens from Bluebonnet Hydroponic Farms, wildflower honey from Good Flow Honey Co., eggs from Happy Chick Farms and Mill-King Market and Creamery’s whole milk. Much of the poultry and cheeses used in the baskets are sourced from area producers, including Pure Luck Farm and Dairy and Wateroak Farm. And all jams, mustards and compotes are produced in-house at Walton’s, as are some of the charcuterie options, like pork terrines and goose pâté. 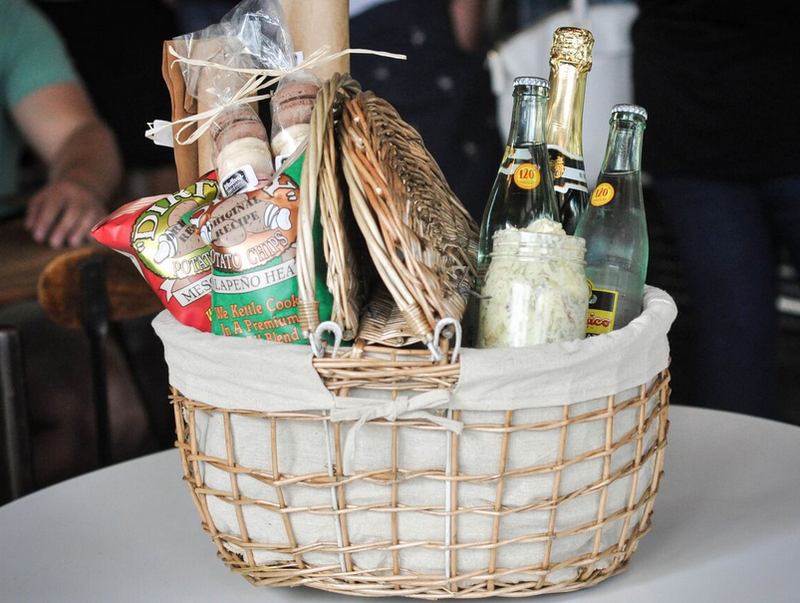 Walton’s summer and autumn picnic packages, which come complete with a crafty picnic basket and a convenient wine opener, include the Standard ($29), which includes two baguette sandwiches, two bags of “Dirty” Potato Chips, one pound of Southern potato salad, assorted macaroons and two Topo Chicos. The Staple Fromage package ($43) comes with two locally sourced cheeses, two cured meats, one baguette, lavash flatbread, Texas honeycomb, marinated olives, house-made fig jam, assorted macaroons and two Topo Chicos. The Fancy Fromage package ($112) is a gourmet feast that includes three artisanal cheese, three cured meats, house-made goose liver pâté, a condiment trio of peach mustardo, apple compote and fig jam, and one baguette, lavash, Texas honeycomb, pickled farm vegetables, marinated olives, spiced nuts, a large bottle of San Pellegrino and assorted macaroons. The Family picnic package ($85) has something to suit everyone’s taste, and includes four assorted baguette sandwiches, a choice of family-style seasonal salad, two pounds of Southern potato salad, four bags of “Dirty” Potato Chips, four gooey chocolate-chip cookies, assorted macaroons, four Topo Chicos and one gallon of house-made lemonade. Featured 10-inch gourmet baguette sandwiches, prepared with fresh-baked “baguettini,” Walton’s version of the traditional French baguette, include the Salumi Biellese with Grafton cheddar, watercress and a Dijon aioli; the Grafton Cheddar & Provolone, served with an apple saffron chutney; the savory Turkey & Gruyere, stacked with avocado, roasted tomato and grain mustard; the Country Pâté & Cornichon with wild arugula; the decadent Prosciutto & Pears, served with blue cheese and horseradish; and the House-Cured Salmon & Farm Egg with a caper compote and goat’s milk cheese. Of Walton’s 10 Local Farm Salad Options available as part of the picnic packages, highlights include the bright Kale salad with roasted cauliflower, seasonal squash, a sherry vinaigrette and sea-salted sunflower seeds; the Sweet Potato & Little Gem Lettuce salad with almond butter dressing, dried dates and cranberries; the Avocado Salad, a rich combination of grapefruit, honey tangerine, red onion, toasted oat croutons and a buttermilk-Bulgarian yogurt emulsion; the Local Greens Salad of snap peas, watermelon radish, sunflower seeds, ricotta salata and a preserved lemon vinaigrette; and the Arcadian Green Salad with sheep’s cheese, squash, a hard-cooked farm egg, red onion, avocado and a honey-tangerine vinaigrette. Picnic package orders must be placed 48 hours in advance by calling Walton’s direct catering line at (512) 391-9966. To add to your basket for an extra special outing, ask about Walton’s selection of wines perfect for pairing with the ideal picnic, such as the light rosé from Texas’ own McPherson Cellars. Walton’s Fancy and Staple is located at 609 W. Sixth St. in downtown Austin. This unique and historic deli offers a variety of meats, cheeses, fresh-baked breads, pastries, and organic teas and coffees. Walton’s is open Monday through Saturday from 7 a.m. to 7 p.m., and Sunday from 8 a.m. to 4 p.m. For more information about Walton’s Fancy and Staple, and the new summer and autumn picnic packages, call (512) 542-3380, or visit www.WaltonsFancyAndStaple.com. Ask about delivery (baskets with wine selections are available for customer pick-up at Walton’s, only). Hungry Austinites looking for a completely unique dining and game-day experience are discovering an ocean of Japanese delicacies, yakitori specialties and sports-bar amenities at the recently opened Pacific Rim Sushi & Yakitori Lounge in North Austin. The only yakitori lounge in Austin, Pacific Rim specializes in serving sizzling, charcoal-grilled, bamboo-skewered seafood, meat and vegetable yakitori—scrumptious dishes traditionally eaten alongside beer or cocktails after a hard day’s work. Perfect game-day fare, Pacific Rim’s yakitori highlights include mouth-watering small plates of escolar ($5.50), bacon-wrapped shrimp and scallops ($6.50 each), salmon ($5.50), lamb ($5.50), pork belly ($5), beef tenderloin ($5.50), shitake mushroom ($4) and chicken ($5.50). Offering a whole new game plan for every sports-bar experience, Pacific Rim serves up all the luxuries sports enthusiasts crave, including a comfortable lounge bedecked with plenty of large-screen televisions airing locals’ and visitors’ favorite sports events. Throughout the month-long Women’s World Cup, Pacific Rim is the perfect spot to catch these historic soccer games all the way through to the finals on July 5, in the comfortable sports lounge. Pacific Rim will show the tournament games all the way through to the finals on July 5. Whether it’s the Women’s World Cup, the European Soccer Cup, the U.S. Open, the Tour de France, Formula 1 races, the Beach Volleyball World Championship or some UFC fighting action, Pacific Rim is the ideal sports bar to kick back with luscious Polynesian cocktails and yakitori while toasting your favorite sports and teams. Co-owned and operated by Benny Leung, one of the proprietors of upscale sushi bar Maiko in downtown Austin, Pacific Rim features a bountiful selection of sushi, from specialty rolls like the Heat of the Moment ($10), a torched spicy tuna roll topped with jalapeño slices, spicy mayo and tobiko; and the Lobster Roll ($15), an unforgettable roll of shrimp tempura, jalapeño, avocado and kani topped with tempura lobster, spicy mayo, eel sauce, scallion and red and black tobiko with ponzu sauce on the side; to classic rolls like the Lump Crab California ($11), with shredded crab, avocado, cucumber and masago; and the Red Dragon ($11), an asparagus tempura, crab stick and avocado roll topped with spicy tuna; to an abundance of fresh nigiri and sashimi. In celebration of its kickoff, Pacific Rim will host a Grand Opening Party on June 24, featuring drink and food specials and all the karaoke guests can croon out. Raise a glass because every day is happy hour at Pacific Rim, with specials offered from 3 p.m. to closing Monday through Friday, and Saturday, 5 p.m. to closing. Happy-hour specials include $2 off any wine or cocktail, including delicious Polynesian cocktails like the Classic Blue Hawaiian (light run, vodka, blue curacao, orange juice and sweet & sour mix); and the Pac Mule (Tito's, plum wine, Ty-Ku citrus, house-made ginger beer, muddled ginger and lime); as well as $1 off Pacific Rim’s extensive beer or sake selections. 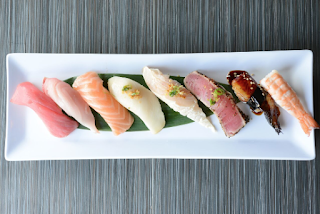 Can’t-miss happy-hour delicacies include selections from the sushi, maki, yakitori, shooters and tapas menus, such as baby back rib tapas ($6), shrimp dumplings ($4.50) baked mussels ($6) and the quail egg shooter ($3.25), with spicy, infused sake, ponzu, masago and chives. Lovers of Japanese cuisine who can’t wait for dinner to gobble up these specialties can head to Pacific Rim for lunch service, featuring a wide array of appetizers, soups and salads, bento boxes, unique lunch specials, specialty sushi rolls, nigiri and sashimi, lunch combinations and indulgent desserts. Must-try lunch dishes include the Wagyu Beef Hot Sizzling Plate appetizer ($18), thinly sliced well-marbled beef cooked tableside with garlic butter and citrus ponzu; the Creamy Japanese Pumpkin Soup ($5), with kabocha squash, brown sugar, togarashi and toasted pumpkin seeds; the Shrimp Yakitori Bento Box ($10), served as all bento boxes are with three pieces of spicy tuna roll, a spring roll, gyoza, soup, salad and fried rice; the unforgettable Saki Mac & Cheese ($11), spiral pasta cooked with white cheddar cheese, a sake reduction, scallions and black sesame seeds; the Texas Monster specialty roll ($13), with shrimp tempura, avocado and jalapeño, topped with sliced tuna and an alluring tequila lime sauce; and the Tempura Banana dessert ($6), delicately fried banana with ice cream, espresso caramel and coffee dust. In addition to all of Pacific Rim’s lunch, happy hour, dinner and game-day offerings, Pacific Rim also features karaoke every Saturday night in the lounge, and live jazz music every Thursday night. 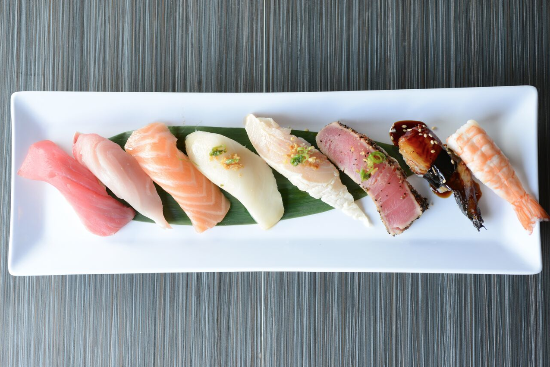 Pacific Rim Sushi & Yakitori Lounge is located at 9070 Research Blvd., suite 305, in North Austin. The only yakitori lounge in Austin, Pacific Rim offers an extensive menu of Japanese cuisine, including yakitori, tapas, sushi and sashimi, combinations, Japanese entrées and desserts, as well as a variety of beers, wines, sake and Polynesian cocktails. Pacific Rim is open daily, with happy hour from 3 p.m. to closing Monday through Friday, and Saturday, 5 p.m. to closing, and features an array of sports-bar amenities. For more information about Pacific Rim Sushi & Yakitori Lounge, the Grand Opening Party and the menu specialties, call (512) 458-8881, or visit www.PRSushi.com. What and Who: Chef Andrew Gerson returns to his roots to bring his beer and food knowledge to the good people of Austin. Armed with some of his favorite pairings from his journeys on the Mash tour, Andrew will speak on the delicate balance of malt and hops and how they interplay with a wide variety of edibles. · What and Who: Austin Mash is staying easy like Sunday morning - or, in this case, like Sunday afternoon. The folks at Easy Tiger will have $1 Brooklyn Lager & East IPA cans, plus Brooklyn beers on tap. What and Who: Our week of cultural happenings gets off and running with this agrarian dining experience. Through roaming culinary events, Dinner on the Farm works to connect people back to the land and to the farmers and artisans who are making our communities a better place to live. There will be a tour of Simmons Family Farm, a feast prepared in collaboration with the Odd Duck chefs and Chef Andrew Gerson (Brooklyn Brewery) and enough beer for all. What and Who: Brooklyn Brewery co-founder Steve Hindy looks back with his fellow craft beer comrades to discuss the circumstances and ambitions that allowed a handful of individuals across the country to challenge one of the largest corporate dynasties in American history. Then they’ll look ahead to the future of good beer and talk about the challenges and opportunities that lie ahead for American craft beer. What and Who: The Found Footage Festival celebrates its tenth anniversary with a brand-new show and DVD (Volume 7). Hosts Nick Prueher and Joe Pickett, whose credits include The Onion and the Late Show with David Letterman, are excited to show off their new lineup of found video clips and live comedy. They love Austin so much that they've decided to host two shows: 7:30pm and 9:30pm. What and Who: This pop-up dinner party, hosted in a unique, non-traditional location, embodies The Mash. The curated evening brings people together around a common table to share cuisine crafted by Brooklyn Brewery Chef Andrew Gerson in collaboration with Dinner Lab’s Chris Bailey to bring you playful, seasonal fare paired Brooklyn beer styles both familiar and rare. · What and Who: In true Brooklyn style, Brooklyn Ha Ha introduces some of the NYC standup scene’s best under-the-radar talent and brings their act to the looser, more freewheeling environment of The Grackle. Co-headlining will be Josh Gondelman and Jesse Popp. · What and Who: Homebrewing: the art of conjuring magic in liquid form. Whether you are a learned veteran with more brewing equipment than living space a brewing novice, this is the event for you. The pros in Austin will guide you through the process of making beer from the comfort of your own home, and clone a Brooklyn Brewery beer. · What and Who: At the end of the day, The Mash is a festival. And what festival is complete without a soundtrack? Certainly not this one. That's why after a full week of feasting on good food, expanding our minds at panels and classes, and filling our bellies with delicious brews, we celebrate our last evening in town with a Bash; a Mash Bash. We're bringing the noise with Marnie Stern, Feral Future and Ghetto Ghouls. The second annual Brooklyn Brewery Mash tour hits Austin, November 15 – 22, 2014 to celebrate what’s next in food, film, comedy, music, books and beer. The Mash tour is the largest traveling food, beer and arts festival, stopping in ten US cities as well as London and Stockholm in 2014. Brooklyn Brewery has collaborated with Austin chefs, artists and craft brewers to create one-of-a-kind entertainment experiences for the whole community to enjoy. In partnership with Slow Food USA as well as select event partners and performers from both Brooklyn and Austin, the weeklong series features exclusive dinners, concerts and lots of craft beers. Austin Mash partners include: Central Market Westgate, Easy Tiger, Simmons Family Farm, School House Pub, The Grackle, Alamo Drafthouse Ritz and Red 7. Steve Hindy, President and Co-Founder of Brooklyn Brewery, who will discuss his new book, The Craft Beer Revolution offering insight and perspective as a pioneer of America’s craft beer movement. Brooklyn Brewery Chef Andrew Gerson has joined forces with Austin’s chefs to offer unique community dining experiences that celebrate local flavors and explore alternative eating spaces in Austin. Check out the Mash video trailer, link here.